Last week, representatives from our team attended the 9th Annual Meeting of Election Management Bodies, a gathering hosted by the International Center for Parliamentary Studies (ICPS). The conference was held in Batumi, Georgia, and focused on the theme “Electoral Integrity: Cybersecurity and the Reliability of Information in the Digital Era”. These gatherings draw together election experts, analysts, representatives from election management bodies and research centers to discuss the challenges and complexities facing elections. During the conference, Jesse Andrews, Director of Business Development, led a conversation that explored elections and elections security in our modern era. 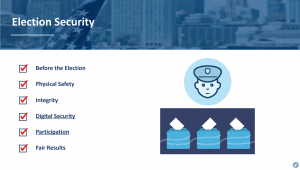 The talk dissected the components surrounding election security: election setup, ensuring physical safety to the voter, securing election integrity, digital security, participation rates and fair results. The crux of the talk posed the question: what is the relationship between security and participation? Often, the two can be at odds with one another — greater security practices can make it harder to participate in elections, and great turnout can make securing polling stations harder. He shared that at Voatz, we consider participation to be part of security, and that both securing the vote and participation are critical for a democracy to function well.